By Far Euphrates, a tale of Armenia in the 19th Century is particularly pertinent in 2015 as we remember the 100th Anniversary of the Armenian Genocide. The history of Armenia is a complex one to untangle geographically and politically. 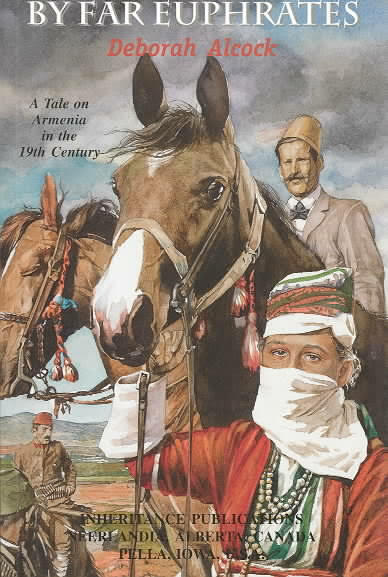 This story is set near the Euphrates close to what is now the Turkey/Syria border and relates the details of the Hamidian Massacres in 1894-1896 which preceded the more well known Genocide in 1915. Interestingly it seems that a friend requested this particular book from Deborah Alcock. This friend had lived through and suffered in the persecution and was desperate for the wider world to hear the truth of the depths that this area of the world had descended to. Miss Alcock worked to a tight schedule and wrote the book in only 5 weeks. It was said that the atrocities her friend spoke of had such an emotional impact on her that she was never quite the same again. Alcock writes with her usual depth and detail but perhaps her direct emotional involvement is what makes this book particularly powerful and gripping. The persecution of Armenian Christians in the late 1800s was truly awful; indiscriminate killing of men and boys, women and children saved alive to be subjected to worse horrors. In a helpful appendix Alcock explains which characters were real and which were fictional. She also makes it clear that the atrocities described in the book left much detail out - she felt it impossible to depict the worst features of the horrible crimes committed. Tragically some of the events described seem sadly and horribly familiar in these current times. Christians are being persecuted in 139 nations around the world. The news that feeds through to our western society is often biased and secular neither recognising nor understanding the religious elements often involved in the incidents reported. I recently read this article 'Why don't we hear more about persecuted Christians' which gives food for thought on this subject. It is a subject which at the very least, should be kept often in our prayers.